The Coliseum Renovation Project will restore one of the most iconic sports and entertainment venues in the world, the Los Angeles Memorial Coliseum. Built in 1923, the Coliseum is long overdue for a renovation. 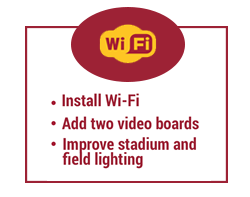 As part of our lease agreement, USC is obligated to make significant improvements to the Coliseum. The estimated $300 million renovation places significant emphasis on creating and improving amenities for all fans to enjoy and is scheduled to be complete for the 2019 season. One-time 20% discount at the official USC online store. Valid through 12/31/19. Discount code will be emailed to the email address on file in July. 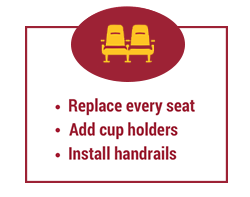 Priority access for 2020 seating selection. 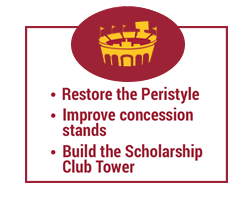 Priority based on lifetime giving and consecutive years of tenure as a USC football season ticket holder. The Trojan Athletic Fund was founded in 1923 to provide the funding necessary to sustain the excellence of USC Athletics’ varsity sports. The members of the Trojan Athletic Fund form a global group of more than 6,000 alumni, parents, former student-athletes and friends who directly contribute to student-athlete scholarships. Memberships begin at $200 annually. Complimentary admission to USC sporting events except football and men's basketball as well as a 10% discount at the USC Bookstore throughout the year. Subscribe to Trojan VictoryMail to receive exclusive ticket offers, updates, giveaways and special event invitations. All ticket orders are subject to availability and while supplies last. USC reserves the right to cancel orders based on limited seat quantities or for any reason. Purchase of season tickets does not create an irrevocable right to purchase season tickets in the same location in any subsequent season. Made with Bootstrap Themes 2016. All rights reserved.